Do not underestimate what our Little Red Dot has to offer us because some locations which are widely known and visited by most Singaporeans may very well be an awesome photoshoot location. Escape from the crowd, far and away from the hustle and bustle of the city. This is a perfect location for couples who seek for (temporary) peace and quietness. Home to a variety of habitats such as mangroves and grasslands, the variety of trees add dimensions to the photos. Who would have known that these photos were taken in Singapore! If you’re a fan of the foresty setting, then you surely wouldn’t want to miss MacRitchie Reservoir. The luxuriant greenery and riverside view serve as the perfect backdrop for a prewedding photoshoot. Immerse yourself in nature and enjoy the tranquillity that it offers. Can’t be there to snap a pic with the Lone Tree of Lake Wanaka that is on the other side of the globe? Don’t worry because we have our very own version of the lone tree as well and it does not, in any way, pale in comparison to the solitary tree in New Zealand. Instead of backdropped by the Southern Alps and growing on the shore of a lake, the Lone Casuarina Tree at Upper Seletar Reservoir is accompanied by the seemingly endless field. Bag a set of beautiful sunset photos if you happen to be there during the golden hour! If you don’t already know, Fort Canning is definitely one of the must-go-to locations if you would like to capture photos like no others. The spiral staircase, featuring the stone wall and lush green leaves, coupled with the tunnel give off a dark and mysterious vibe that is strangely alluring. Trust me, you’ll walk home with a set of stunning portraits that’ll leave everyone in awe. The Neo-Palladian style of architecture truly served as the perfect backdrop for couples! If you are in the camp of a clean, white Instagram feed, you’ll definitely love what our National Museum can offer you. The highly symmetrical façade and white furnishing of the museum sure allow you to achieve a clean, minimalist photography theme. Catch the free Light and Water Show at Marina Bay Sands! The laser lights and fountain jets synchronised flawlessly with the soundtrack. Let the aesthetic laser lights and jets dance & celebrate your union while painting a beautiful picture on the night sky for your prewedding photoshoot! Gardens by the Bay, one of the iconic locations in Singapore that draws both thousands of local and international crowds each year surely has its highlight. Grabbing home numerous awards and accolades eg the Largest Glass Greenhouse in the Guinness World Records for 2015, our Flower Dome exhibits exotic flora and fauna from five continents which are boasted in nine different Gardens! The famous Supertree structures dance in colourful lights at specific timings everyday so be sure catch the glamour in your photos. Some of these locations may indeed fool people into thinking that they are destinations overseas and we hope we’ve sparked inspirations in this guide! 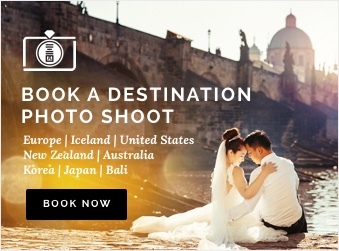 If you’re searching for a photographer, whether it’s for your prewedding, AD or your honeymoon, we are here to help! Head over to our website to check out our photography packages and we look forward to documenting your precious moments with your loved one soon!